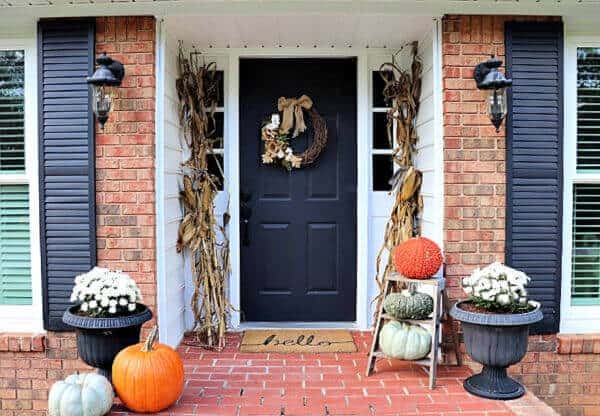 Don’t let the busyness of life keep you from creating a welcoming front porch. 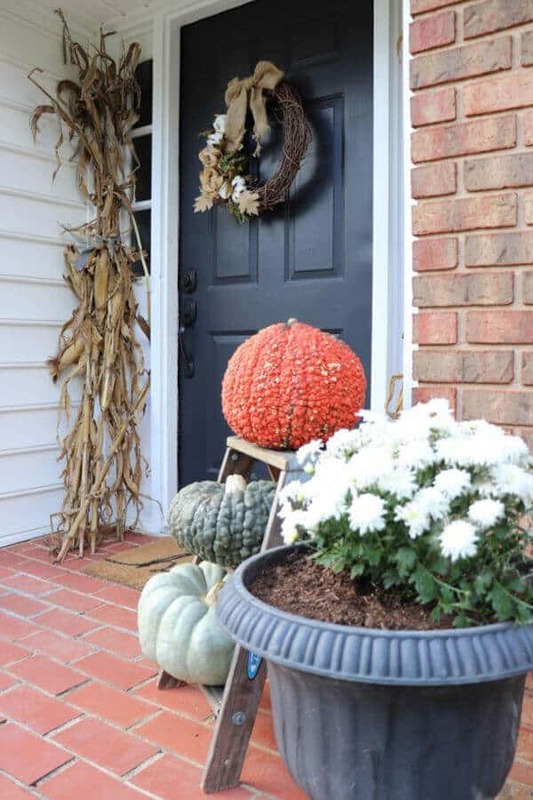 This quick and easy fall porch is one you can style in just a few minutes. Who knew a trip to the bank would inspire a seasonal overhaul of my front porch?! So there I was, sitting in the drive thru at my bank and I looked across the street and boom – I saw fall inspiration from a tiny shack of a mulch dealer. 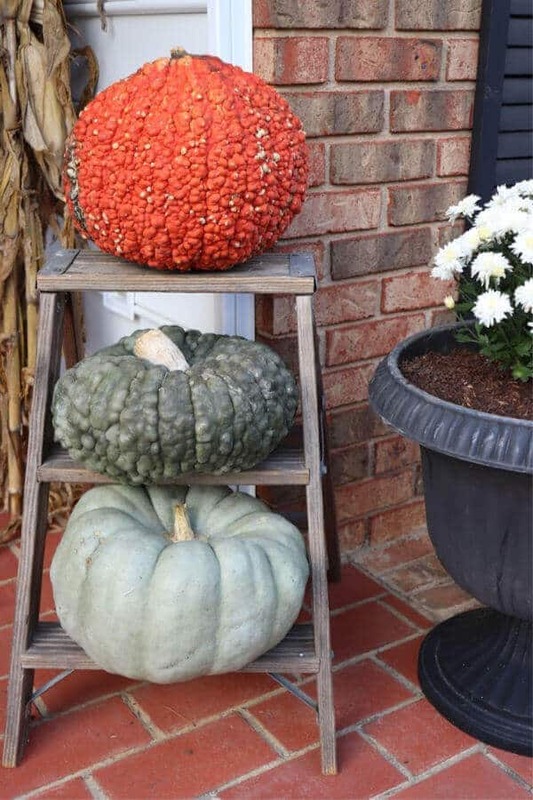 Pumpkins, mums, and dried cornstalks – oh my! One stop shopping for a quick and easy front porch refresh. But was I too late to the party? October is almost gone – so is it worth it? 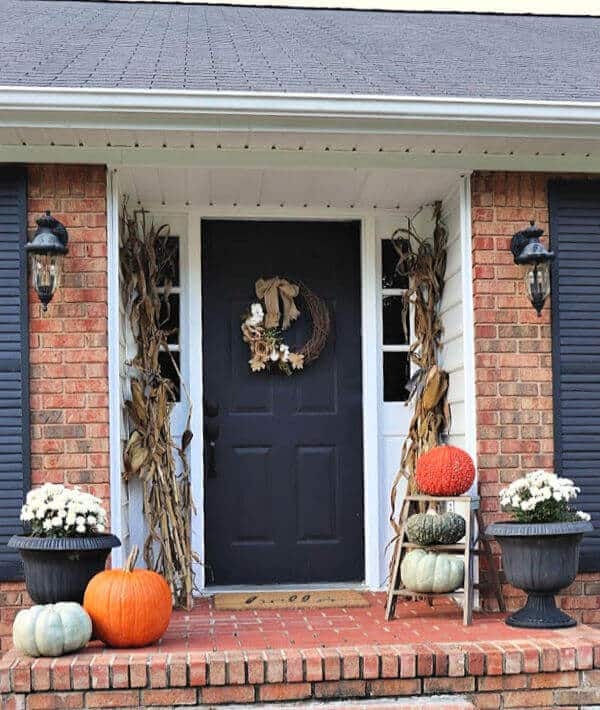 I drove away with a car filled to the brim with fall goodness and knew that even if it’s just for a moment – this seasonal touch would bring me happiness! First, let me say that the state of my front porch up to this point consisted of the previous owner’s front mat that had seen better days and our empty planters that were plopped down after our move 6 weeks ago. I didn’t have a lot of time with a bathroom remodel going on, and still getting settled with our move. So I took just 15 minutes to put this fall front porch together. All I needed to gather were a few items from my home. I tossed the old forgotten left behind doormat, and brought out the one from our Tennessee front porch. The cornstalks framed the doorway waving hello to all the passers-by. A quick piece of ribbon tied around them added a touch of fun. 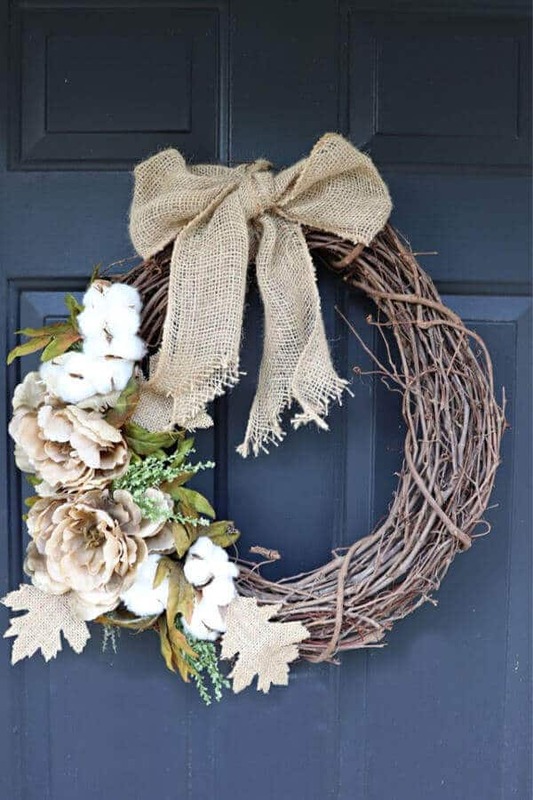 I made this fall wreath last year, but never got around to hanging it. So this DIY made it’s debut performance on our new front door. 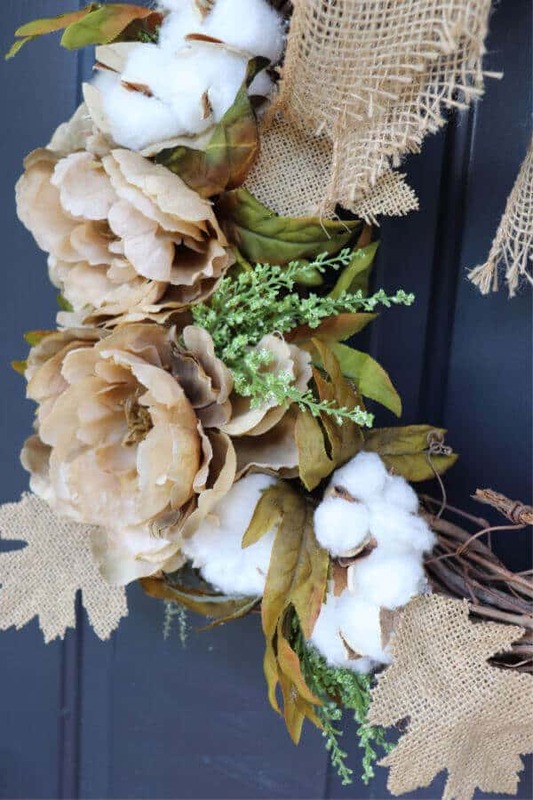 Using hot glue, I pieced together muted fall flowers, cotton bolls, and faux greenery to make an easy wreath. I found those burlap leaves last year and just loved them! I used them on my Fall Bunting I made last November. And aren’t these knotty pumpkins the coolest? The previous owners gifted us this wooden stepladder, which acts perfectly as a pumpkin prop. The mums found their home in the empty planters. 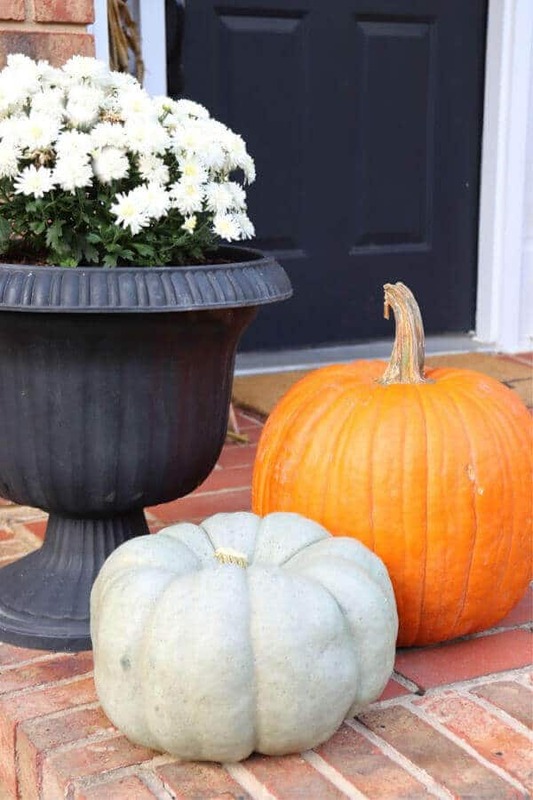 A quick pairing with a few more pumpkins on the other side makes for an easy and balanced porch. So it’s not my favorite porch (yet) as I have dreams for our exterior. And it’s not the latest decor from Hobby Lobby – but leftovers from last season work just as well. I know you’re like me and crazy busy at times. But sometimes, you have to stop when your heart leaps for joy. Sometimes you have to take a $20 bill and fill your car with autumnal bliss so you can smile at the season when you drive up to your home. 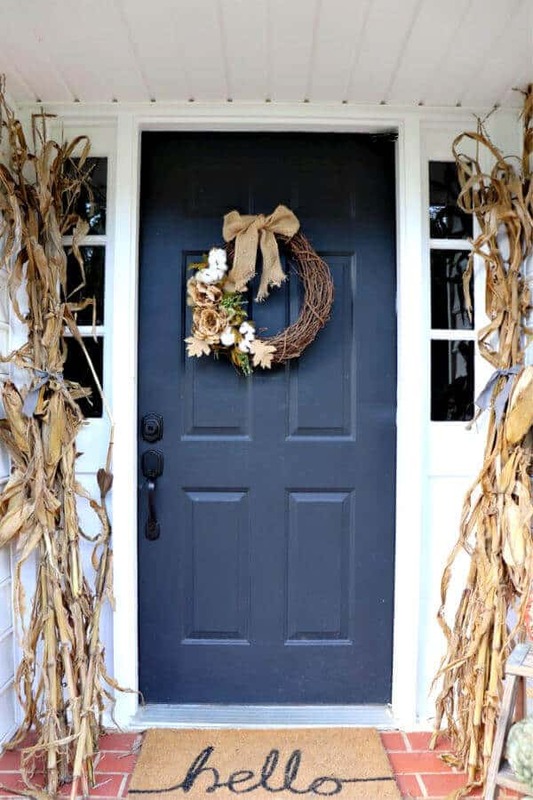 It doesn’t take a lot of time or effort to create a quick and easy fall porch for your home. Even in busy seasons – like recovering from a move, or starting a huge remodeling project. 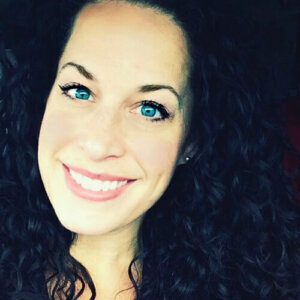 Or just being a mom – juggling practices, shopping, laundry and groceries. Phew – we’ve all been there at some point, where each day is like groundhog’s day on repeat as we struggle to make it through another day. But I’m learning to listen to my heart. I’m learning to leap when prompted and smile when it happens. Listen to your heart and find special spaces for you. Big or small, take time to enjoy the home you’ve been blessed with. I hope this fall porch inspires you to make a quick switch this season. If you have tips to share – please leave them in the comments below – I love to hear how my readers got through a tough time.